Despite the existence of numerous lobbying disclosure reports, the Department of Homeland Security has told American Oversight that, after a “comprehensive” search, it cannot identify any records of communications between DHS political appointees and representatives of a fast-growing, Trump-connected lobbying firm. Ballard Partners has reportedly expanded its business at an astonishing clip during the Trump era thanks to the political connections of founder Brian Ballard, the Trump campaign’s former Florida finance chair. 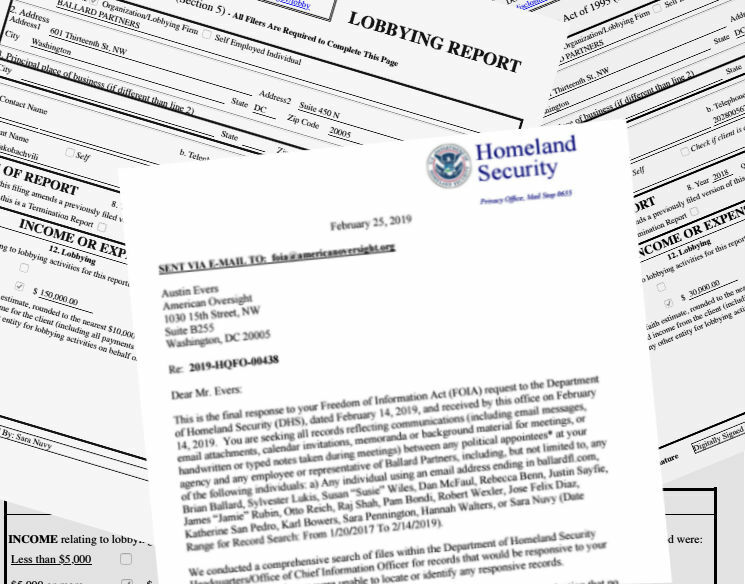 The firm has filed numerous lobbying disclosure reports indicating that it is lobbying DHS on behalf of clients collectively paying hundreds of thousands of dollars. It would be extremely surprising if Ballard Partners had carried out such significant lobbying efforts exclusively through communications with career staff and not with the political appointees who oversee major policy decisions. American Oversight has appealed the department’s claim, citing Ballard Partners’ numerous disclosure reports. If there really are no records reflecting any communications between Ballard lobbyists and DHS political appointees, it would suggest that Ballard Partners may have been seriously exaggerating the extent of the lobbying services it has performed for its clients. In one report, Ballard Partners declared that it received $150,000 from Russian businessman David Iakobachvili for lobbying DHS on trade and immigration policy in the second quarter of 2018. The firm also declared that it was lobbying DHS on behalf of Uber, the City of Miami Beach, and several other clients, generally receiving between $30,000 and $50,000 for its efforts.